Did you know that about 90% of the worldâ€™s goods are shipped the water way? About one billion ton of CO2 is emitted by ships, every year. 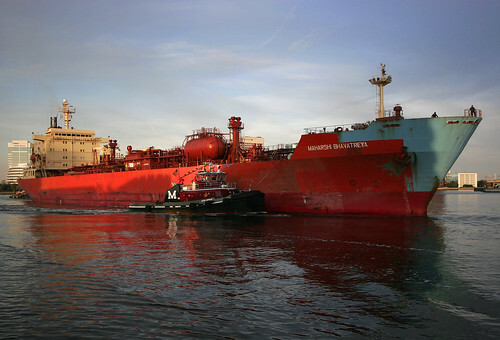 The ships energy demands are expected to rise by 75% in about 15-20 years. Did you also know that 4% of the worldâ€™s greenhouse gas emissions come from ships? This can be compared to the aviation industry that emits about 2%. According to a leaked UN study, the annual emissions from the world's merchant fleet have reached 1.12 billion tonnes of CO2. That is nearly 4.5% of the world's greenhouse gas emissions. Creative-Commons Attribution-No Derivative Works license. But if all the goods that were transported by ship, were transported by plane, the emissions would beâ€¦â€¦..
Of course you are correct. Dont get this post wrong. This is in no way a defence for the aviation industry. The figures are quite frightening but here are some more scary numbers from General Motors research department: There are 6.68 billion people on the planet Only 13 per cent (about 875 million) of the population own a car By 2020 the population will have risen to 7.5 billion By 2020 about 1 billion (or 15 per cent) will have a car Around 35 per cent of world energy is derived from oil Oil is used for 95 per cent of transport needs. By 2030 energy needs will have increased by 60 per cent Are we doing too little, too late? Is energy Armageddon inevitable? They are scary numbers, arenâ€™t they? List of Shipping Companies â€“ Shipping company names in world, shipping company owners, companies by cities, company names by country. For more details on shipping companies please log on to the above link.